Except for the Picture Cards and Sound Slider, second edition materials will not mix and match with the first edition of Learning to Read. 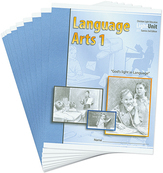 Language Arts 100 Second Edition LightUnits are integrated with this course. Students begin Language Arts 101 LightUnit when they begin Learning to Read 105-05 LightUnit. 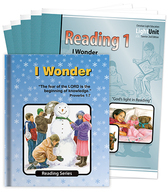 After completing Learning to Read, students will be ready for the Reading 100 I Wonder reader and workbook. Click here to view the introduction from the Learning to Read Teacher's Guide. An overview of the integration is included on page xv. For teachers who are not familiar with teaching phonics, our Learning to Read Training LightUnit and CD explains how to teach Learning to Read. Sunrise 2nd Edition Reading 100 is a sequel to the Sunrise 2nd Edition Learning to Read program. The first-grade reader, I Wonder, is full of delightful age-level stories and poems that develop critical reading skills while building character. Students will learn about honesty from Betsy and Billy, the importance of prayer from Willy, good habits from Bruce the door slammer, and trust from Bennie, who was afraid of thunder. The artwork has recently been updated to full-color paintings. The accompanying five new LightUnits helps students practice phonics, reading comprehension, and analytical thinking. A test in each of the LightUnits measures the child’s mastery of the material. 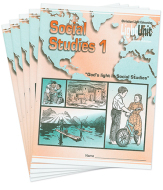 The Teacher’s Guide includes oral reviews, a reproduction of each workbook page with answers, detailed instructions for explaining the exercises, ideas for class discussion, and silent and oral reading activities. Beginning teachers can successfully when using this manual to teach reading. Bible 100 contains well-written stories from both the Old and New Testament. They captivate the first grader’s imagination and bring the Bible to life. 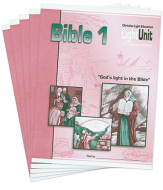 Each LightUnit has sixteen lessons, providing two or three Bible lessons a week for a full school term. A lesson consists of a two-page simple Bible story and a corresponding activity such as a maze or puzzle, matching exercises, or a dot-to-dot picture. The Teacher’s Guide contains a more detailed version of each story for the teacher to tell or read. Without quizzes or tests, this course allows the child to enjoy the Bible and learn its truths without a heavy workload. Our goal is for Bible to be so enjoyable that students look forward to every class. Sunrise Math 100 lays a foundation for many of the major math concepts the student will meet during his lifetime. Each lesson introduces one or more bite-sized new number concepts. Most of the student work consists of continuous review to ensure that the concepts stick. The child experiences math as a whole rather than as isolated skills. Interspersed with basic number skills are forays into geometry, our money system, mental math, and number patterns. Practical story problems with a Biblical worldview relate math to real life. The U.S. and the metric measurement systems are emphasized equally. Daily speed drills, oral drills, and flash-card exercises help cement the basic addition/subtraction facts from 1-20. The Teacher's Guide provides answers to the LightUnits, ideas, useful appendices, and alternate LightUnit tests and is required for the course. 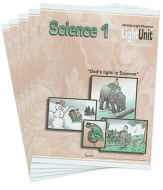 Sunrise Science 100 consists of five LightUnits introducing basic knowledge about the natural world. The five themes, one per LightUnit, are Seeing and Feeling, You and Your Pets, God’s Beautiful World, The Earth and Energy, and Music and Science. Each LightUnit is designed to take seventeen days, and contains two quizzes and a test. Each lesson is on the child’s reading level and includes two to four pages of activities for the lesson. Activities vary from categorizing items by their properties, to exploring the five senses, observing their environment, and learning science-related vocabulary. 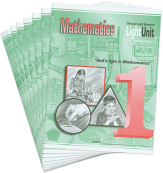 The Teacher’s Guide includes a reproduction of each LightUnit page with answers and ideas for capturing your child’s interest and providing hands-on activities to enrich the learning experience. It is required for the course.